If there's one thing the Motorola Moto G has taught us, it's that budget-priced smartphones make for good headlines - a lesson Nokia and BLU Products are taking to heart this week. CNET reported today that Nokia has quietly debuted a sequel to its Lumia 520, a Windows Phone 8 handset that has found a niche as a favorite among prepaid and off-contract smartphone buyers around the globe. Nokia's followup is the previously leaked Lumia 525, which checks off nearly all of the same specs as its predecessor, while doubling the operating RAM from 512MB to 1GB - enough to run pretty much every game offered in the Windows Phone Marketplace. Unfortunately, North American buyers may have a long wait ahead of them - Nokia is targeting the Lumia 525 at Africa, Asia Pacific and Middle East countries first, after which time it will presumably wash ashore on this continent. Speaking of budget-minded smartphones, BLU Products announced (via Engadget) the latest Android handset in its Blue Life series, the Android 4.2 Jelly Bean-powered Blue Life Pro. Operating on quad-band GSM networks with 4G HSPA+ 42Mbps connectivity, Blue Life Pro has the distinction of being one of the few smartphones with a 5MP front-facing camera capable of taking higher-resolution selfies than ever before. Only 6.9mm thin with "premium aluminum construction design," the handset also includes a 12MP rear camera and the usual raft of wireless connectivity including 802.11b/g/n Wi-Fi, built-in personal hotspot and Bluetooth 4.0. 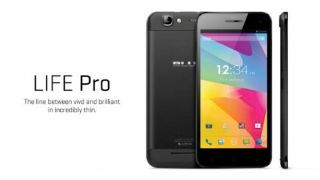 Blue Life Pro features a five-inch IPS HD display powered by a quad-core 1.5GHz MediaTek MT6589T processor; the handset is will be available unlocked from Amazon and select dealers across the US, Brazil and Mexico for $299 (about UK£184, AU$330). You can pick up an unlocked Moto G from Motorola now.